Reinstate Fired Boston School Bus Union Activists! 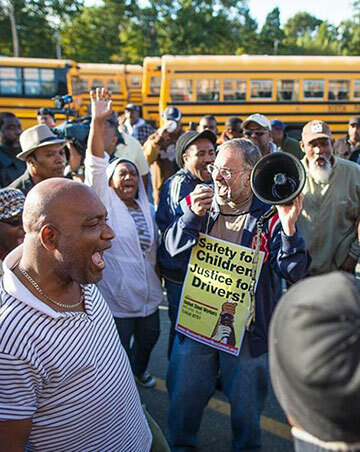 Above: Boston school bus drivers picket and rally after Veolia management locks them out, 9 October 2013. Below. 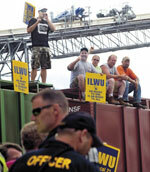 USW Local 8751 grievance committee chair Steve Kirschbaum speaking with drivers during rally. In Boston, a union leader is going on trial March 3 for the “crime” of holding a union meeting, and four union activists are fighting for their jobs. The Democratic Party establishment of Boston is pressing on with its years-long drive to break the school bus drivers union, United Steelworkers (USW) Local 8751. All of labor, education workers, supporters of racial integration and defenders of black rights have a stake in this fight. We urge unions and others to demand that the frame-up charges be dropped and the union activists reinstated. The felony charges against long-time union activist Stevan Kirschbaum, on top of the firing of him and the other union activists, stem from an October 2013 lockout of the drivers for protesting company contract violations, harassment and abuse. 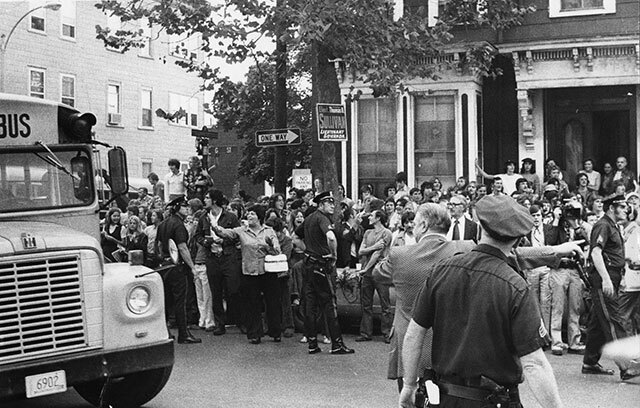 They are part of a racist assault on the union’s mostly Haitian, Cape Verdean and Dominican members, and of Boston rulers’ drive to tear up the remnants of busing, the partial desegregation of public schools implemented in 1974 over the opposition of racist lynch mobs organized by Democratic Party politicians. Facing trumped-up felony charges, Local 8751 grievance committee chair Kirschbaum is actually on trial for holding a union meeting in a bus yard break room on June 30, 2013 to hear a briefing on contract negotiations. According to the prosecutor doing the bidding of the bosses, that’s supposedly “trespassing,” even though the break room was open and accessible to drivers. Kirschbaum, Local 8751 president Steve Gillis, Andre Francois (recording secretary and Charlestown chief steward), Richard Lynch (steward and Local founder) and Garry Murchison (steward and three-term former local president) were all formally dismissed by Veolia, the bus management company, in November 2013. Lynch has since been reinstated, but the other “School Bus Union 4” have been out of work for the last 16 months – fired for leading union pickets and protesting the management’s lockout. Union school bus workers around the country are under attack as multinational corporations have taken over the industry. In 2012, Local 8751 struck against the previous employer, First Student, a British-owned company that operates out of 650 locations in 42 states. When the Boston school bus drivers’ won retirement benefits and beat back concessions by standing firm, city authorities responded by bringing in Veolia, now operating under the name Transdev, a France-based company with over 110,000 employees in 28 countries. Veolia’s specialty is union-busting. Transit workers around the country are well-acquainted with the machinations of Veolia. Company vice president Thomas Hock privatized New Orleans transit operations and was contracted by the San Francisco Bay Area Rapid Transit system at $3,400 per day to attack health, safety, wages and pensions of BART workers during the 2013 contract fight. Two scab engineers were killed by a scab train operator the day after the unions were forced to strike (see “Lessons of the On-Again, Off-Again BART Strike,” The Internationalist, November 2013). The assault on school bus drivers is part and parcel of the bipartisan capitalist attack on public education. In New York, 8,100 drivers and matrons of Amalgamated Transit Union Local 1181 were forced out on strike in January 2013 by union-busting mayor Michael Bloomberg, who vowed to ditch any form of job protection. Class Struggle Education Workers, a union tendency in solidarity with the Internationalist Group, came out to picket day after day (see “School Bus Drivers’ Strike: Mobilize NYC Labor to Win!” The Internationalist, January 2014). Yet the powerful United Federation of Teachers did nothing to help the ATU strikers. 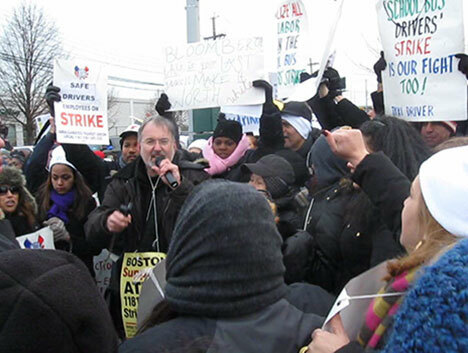 To its credit, USW Local 8751 brought a caravan of school bus drivers down from Boston in a show of solidarity. After a month on the picket lines, the strike was sold out by ATU leaders in exchange for empty promises from Democratic mayoral candidates to “revisit” the issue if elected (“The Betrayal of the NYC School Bus Strike,” The Internationalist, February 2014). Liberal mayor Bill de Blasio was elected, but some 2,500 fired union drivers and matrons are still out of work. Union statements backing the Boston drivers have attacked Veolia as a “French company.” Yet who is responsible for contracting this notoriously anti-union outfit? Veolia is doing the dirty work for U.S. rulers, and specifically for phony “friends of labor” like Boston’s mayor Martin Walsh. Walsh, a former leader of the Building Trades Council, venomously attacked Local 8751 during the 2013 lockout, but was endorsed by the USW district council and most of labor. Meanwhile, Obama’s education “czar” Arne Duncan is leading the attack on teachers unions. The firings and prosecution of Local 8751 leaders came on the heels of Boston’s dumping the last vestiges of court-ordered busing to overcome school segregation in March 2013. When busing was introduced in the fall of 1974, the courageous school bus drivers and black children were attacked by rabid stone-throwing racists. At the time, Trotskyists (including founders of the Internationalist Group) fought for independent labor/black defense of the bused students, while much of the left, including the Socialist Workers Party and Workers World, tailed after Democratic Party liberals calling for federal troops to Boston. Forty years later, defense of racial integration and union rights still go hand in hand in the struggle against a racist, labor-hating ruling class. Schools today are just as segregated as they were at the time of the 1954 Brown v. Board of Education Supreme Court decision declaring that separate is not equal. So long as workers – black, white, Asian and Hispanic – are chained to the capitalist Democrats by labor bureaucrats, including of more combative unions like Boston school bus drivers’ Local 8751, they will find themselves blocked in resisting the bosses’ attacks. In the face of the concerted assault by city rulers out to destroy the jobs and union power of black and Latino workers, who want to put a union leader behind bars for holding a union meeting, it is necessary to break the chains binding working people and the oppressed to a section of the ruling class. What’s needed is a mobilization of working-class power, uniting workers, teachers, parents and students to teach the arrogant racists in City Hall a well-deserved lesson. That requires building a workers party on a program of sharp class struggle. Drop the charges against Stevan Kirschbaum! Reinstate the fired Boston school bus drivers! Kirschbaum’s trial is scheduled to begin on Tuesday, March 3 at 9 a.m. in Dorchester Municipal Court, 510 Washington St, Dorchester Center, MA 02124. Supporters are urged to attend the hearings. Donations and statements of support for the legal defense and the welfare of the fired Boston school bus union activists are urgently needed. Checks and statements should be sent to Friends of the School Bus 5, P.O. Box 141, Stoughton MA 02072.